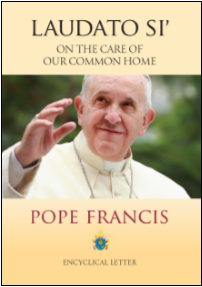 In his encyclical Laudato Si´, Pope Francis challenges us to care about and take action against climate change. Laudato Si´ “unambiguously accepts the scientific consensus that changes in the climate are largely man-made” and states that “climate change is a global problem with grave implications: environmental, social, economic, political and for the distribution of goods. It represents one of the principal challenges facing humanity in our day” and warns of “unprecedented destruction of ecosystems, with serious consequence for all of us” if prompt climate change mitigation efforts are not undertaken. Although the science and politics surrounding climate change are still debated in the United States – unlike in most countries in the world – Pope Francis has no doubt that climate change is occurring and must be quickly addressed. Carbon dioxide is at its highest level in 650,000 years. Seventeen of the eighteen warmest years on record have occurred since 2001. Arctic ice and polar ice sheets are losing mass at alarming rates. Sea level has already risen seven inches in the past century. The evidence of climate change is overwhelming, which is why 97% of actively publishing climate scientists agree that the climate is changing and that human activities are responsible. To learn more about how we can meet the pontiff’s challenge on climate change, please visit the website for Catholic Climate Covenant: www.catholicclimatecovenant.org. Also, as always, consider this important issue of Catholic social teaching in mind when voting and when communicating with your elected representatives. It is not too late to put our faith into action on climate change! However, there will soon come a day when we are past the point of no return for preventing devastating ecological damage, mass extinctions, and human suffering. We must remember we have borrowed the earth from our grandchildren. We must also remember God has trusted us with the gifts of creation and asked us to be good stewards of its care.